The area is a favorite dwelling place for retirees; conversely, it’s possible to embrace an active urban lifestyle in a downtown loft with sweeping views of the water. Victoria is a high-tech business center, a hub of commerce and government, and it boasts several universities. Within walking distance of many neighborhoods, one can find floral shops and markets, local artisans and craftsmen, designer fashions and furnishings from the wider world, and all the trappings of modern life. 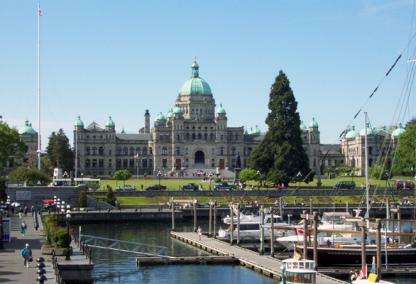 Victoria, British Columbia, seems a gem set in a sparkling display of other jewels. With history and architecture that captivate visitors and residents alike, it has diverse attractions and cultures, a Wealth of pageantry and tradition with Provincial Parliament buildings and grounds, and the legendary Empress Hotel. It’s a delightful destination to visit; and residents speak in glowing terms about their lives here. Victoria serves as the center of a large metropolitan zone, although even with a population now exceeding 80,000, the city still boasts distinct neighborhoods; It’s still possible to explore many of its areas on foot, including Chinatown, and its many parks and plazas invite walking and lingering. The Inner Harbour is a gathering spot as well, with street performers, musicians and a never-ending parade of boats, people and activity. Life is easy here, and pleasant. For the most part, weather is mild and balmy; the out-of-doors is a special attraction from spring until fall with profusion of color. Water, of course, is the focus. There is superb and efficient ferry transportation to both Vancouver, B.C., and Seattle on the mainland. Leisure activities, as well, often focus on the water: Private boats ply the waters between the city and the Gulf Islands or popular San Juan destinations. And there is the whole of Vancouver Island to explore by road.